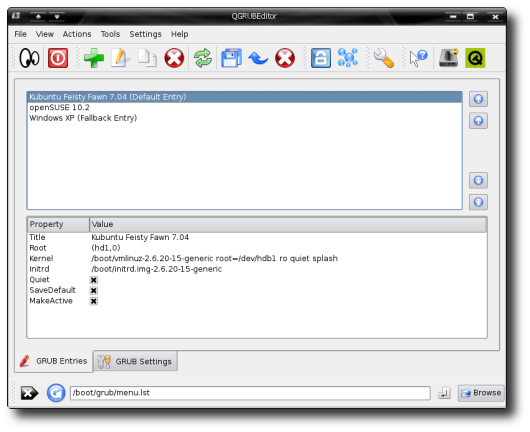 There is a tiny little program called QGRUBEditor. It is a system GUI tool to view and edit the GRUB boot loader. It offers many features and it is the perfect solution for those who want to change the way GRUB works, without messing with GRUB’s configuration files. This is an excellent tool for a new user. If you’ve been running Linux long enough to have upgraded your system more than once, you probably have several Linux kernels lurking around your system. If you discover that a certain application no longer works for you, you can go back to a previous kernel to try to run your program. GRUB, the boot loader found in most Linux distributions, lets you choose among operating systems and kernels installed on your box. Many people, however, fear that messing with GRUB may ruin their system, because of its many esoteric options, and configuration file text that often contains no help comments. QGRUBEditor can help you view and edit the GRUB boot loader from a graphical user interface.